Toronto Dogs Directory: Will The OSPCA Lay Charges Against Officer(s) Who Repeatedly Drove Over Dog Before Shooting It? 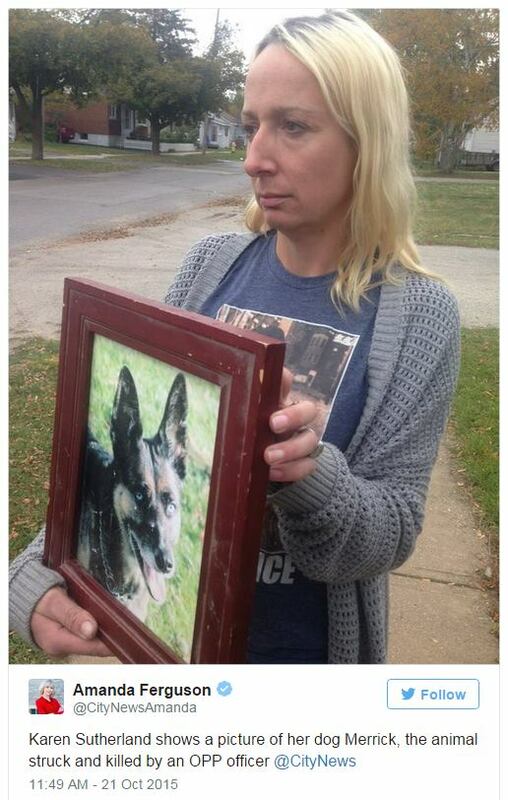 Will The OSPCA Lay Charges Against Officer(s) Who Repeatedly Drove Over Dog Before Shooting It? Had the video not been filmed it is likely the public would have never known about the incident, or what was to follow. On Tuesday, in response to social media outrage the OPP issued a statement that the coyote was rabid, posed a danger, and they were protecting citizens. Once people began questioning the statement the OPP issued a second statement that the coyote was, "possibly rabid". Later on Tuesday afternoon an individual came forward stating he believed the animal in question was not a coyote but rather his 21 year old blind and deaf dog who had escaped his yard due to an open gate. For the remainder of the afternoon and into the evening people were kept waiting for a statement from the OPP. Yesterday I expressed on the Toronto Pet Daily Facebook page it was next to certain the animal was indeed a dog, that the OPP would have been more forthcoming with a statement had the animal been a coyote. On Wednesday morning the OPP finally released a statement through its Twitter account that the animal in question was indeed a dog, though they did not state if it was the elderly blind and deaf dog. The OPP also issued a statement that it was too early to determine if the dog in question was rabid, bringing into question how they could have made such a statement about what they thought was a coyote just one day earlier. The question now is, "Will the OSPCA lay charges against the officer(s) in question?" "the Ontario SPCA Act mandates the Society to enforce animal cruelty laws and provides Ontario SPCA Community investigators with police powers to do so." I could pose the question, "SHOULD the OSPCA lay charges? ", though it's rhetorical. Of course charges should be laid. On Monday evening the officer(s) chose the absolute cruelest method possible to solve the problem, regardless of whether the animal in question was a coyote or a dog. Running over an animal THREE times before shooting it to death is simply disgusting, and beyond inhumane. It is animal cruelty of the worst kind, the kind the OSPCA is mandated to investigate. Remember, this is an organization that has no problem enforcing animal cruelty laws when citizens' dogs have tartar on their teeth. The OSPCA should at least take equal action when it sees an individual, regardless of their occupation, drive over a dog three times and then shoot it to death, no? Let me know in the comments below or on the Toronto Pet Daily Facebook page how you think this will play out. Do you think the OSPCA will lay charges against the officer(s) responsible for this act of cruelty? If I were to hazard a guess (believe me I'm quite good at doing so when it comes to this organization)? Not in a million years. RIP Merrick. I am so very sorry these were the last minutes you had on this earth. Here is a petition demanding the officer(s) in question be charged. Today, CityNews interviewed Merrick's owner, Karen Sutherland. You can read the interview here.